Eat Fit Food: Recipe + a Special Offer! Curious to try Eat Fit Food but haven't yet? Now is your chance - they have a brand spankers new ‘Taste Test’ package (where you can order one meal a day for three days). They just know that once you have tasted the quality and sheer deliciousness of their wholefood meals, you will long for more, especially given the ease and convenience of their service – fast, fresh and simple (no need to spend your spare time grocery shopping/cooking/cleaning/washing up…bliss!). Try them out for only $69 with code 'TABLETONIC' (save more than 40%!). 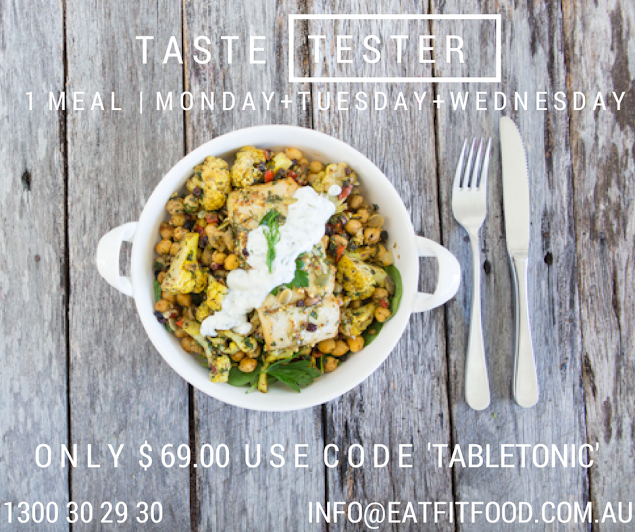 To sign up for your ‘Taste Test’ special give Eat Fit Food a call on 1300 302 930 or email them (info@eatfitfood.com.au) before 5pm on Friday 4th July. In a bowl mix the olive oil, Moroccan spice, chopped coriander root, turmeric and fennel seed. Retrieve water that was used to soak currants and add to spices. Mix the raw cauliflower florets through the spice mix and steam roast for 10-12 mins, enduring it is cooked but not overcooked. Allow to cool. Add cauliflower florets to drained and washed chickpeas. Add soaked currants, chopped coriander and parsley leaf. Method: Marinade the fish in chopped herbs (parsley, chives, mint) in a bowl. Put fish a tray and put a slice of lemon on each fish it fish. Bake fish for 12-14 minutes at 165 degrees. Add 5g toasted pine nuts to each portion and ENJOY! FISH includes Omega-3 fatty acids. According to Australia’s leading health research body, the National Health and Medical Research Council (NHMRC), suggests that Australians should eat more fish and aim for two or more serves weekly. 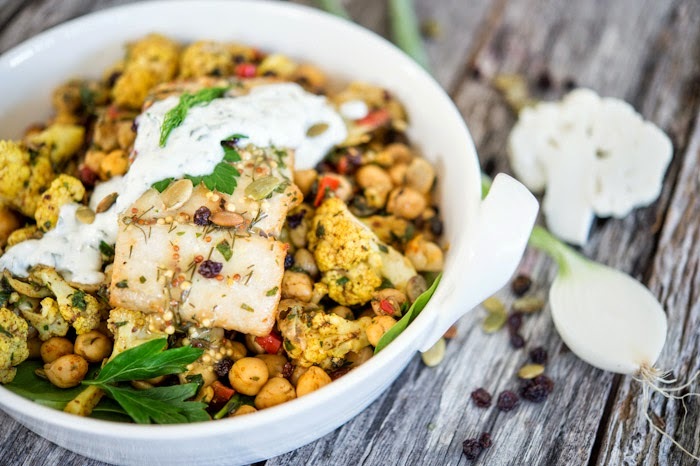 CHICKPEAS provide a great source of plant protein, fibre and iron. The currants provide a delicious sweetness and the mix of cauliflower, herbs and spices fills this dish with an array of flavours. CURRANTS provide a different flavour and are smaller in size to the common dried grape, sultanas. Currants are high in fibre and low in saturated fats, cholesterol and sodium. Currants are also a good source of potassium, manganese, Vitamin C and Vitamin K. As they are dried, they are concentrated source of calories, sugar, and nutrients, so you only need to add a small amount. For a vegetarian meal, you can omit the fish as the chickpeas will provide a great source of protein. TURMERIC In the world of herbs and spices, there’s one that leads the pack in terms of healing - turmeric. If you can find turmeric in root form, you can even juice it and add some lemon, lime, and honey for a delicious healing drink. HOT TIP: To supercharge its healing abilities, don’t skimp on the black pepper. When you mix turmeric together with black pepper you greatly enhance your body’s absorption of it. TO RECAP: Try Eat Fit Food out for only $69 with code 'TABLETONIC' (save more than 40%!). To sign up for your ‘Taste Test’ special, call on 1300 302 930 or email info@eatfitfood.com.au before 5pm on Friday 4th July.